Combine the flour, cocoa, baking soda, and salt in a small bowl and mix together thoroughly with a whisk or fork. Set aside. Beat the butter and margarine with an electric mixer for a few seconds just until blended. Add the granulated sugar, brown sugar, and vanilla and beat at high speed for about 1 minute. Beat in the egg white. Add the flour mixture and mix on low speed, just until incorporated. Gather the dough together with your hands and form it into a 9- to 10-inch log. Refrigerate for at least 45 minutes, or until needed. Preheat the oven to 350F. Position racks in the upper and lower thirds of the oven. Use a sharp knife to cut the dough log into slices a scant 1/4" thick. Place 1 inch apart on cookie sheets and bake for 12 - 14 minutes, or until the cookies puff and crackle on top, then begin to settle down slightly. Rotate baking sheets from top to bottom and front to back about halfway through the baking time to ensure even baking. 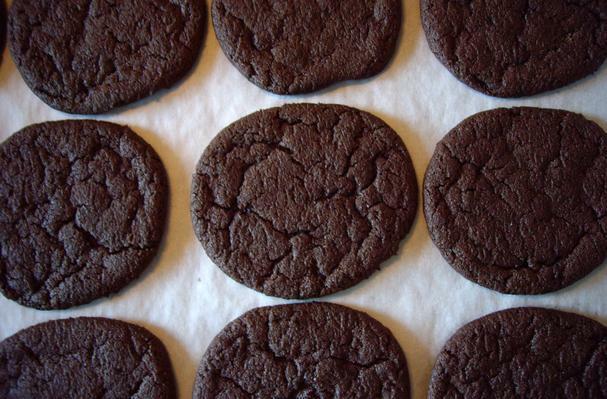 Slide the parchment or foil onto cooling racks and cool the cookies completely before storing or stacking. * If trying the Mexican variation, consider a different chile than cayenne. The cayenne added heat, but also a sour aftertaste. Something complementary (like ancho) might evoke something fascinating like chocolate mole. * The log gets very soft when you take too long to slice it, so you may have to re-form the log midway through. * These cookies puff up in the oven, but they settle and crack. After they cool they're chewy. This recipe comes from Alice Medrich's Cookies and Brownies.